With investing, you often get what you don’t pay for – fees matter. Please consider ditching your expensive mutual funds already if you haven’t already done so! Keep your investing fees as low as possible for as long as possible. Diversify your investments across companies, countries and continents to reduce equity risk versus owning just a few stocks that could sink your portfolio. Stay invested for decades if you can – regardless of what the stock market does or doesn’t do. Rinse and repeat until wealthy. I’ve been following these principles with my dividend focused portfolio for almost 10 years now – and the results are really starting to show. While the basics of investing are easy to grasp, arguably simple to understand, our bad behaviour and various decisions often get in the way. Meaning, investing can seem simple but it’s certainly not easy. 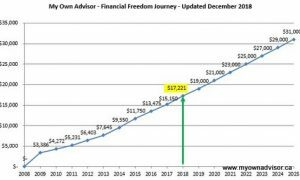 Before I share our dividend income update from our non-registered account and TFSAs, like I do every month here, I thought I would answer a few reader questions…so here they are with some adjustments and paraphrasing! Also….for money needed in 2 years bonds in an unregistered account can have a negative return after taxes and inflation, same goes for a HISA. Just curious what your thoughts are! 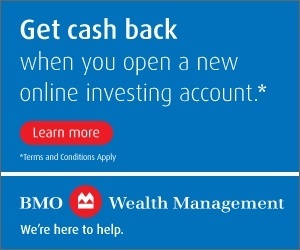 I was wondering if you could give me some advice on where to put my money after maxing out my RRSP and TFSA contributions. I saw on your website that you put it in Canadian dividend paying stocks. How about ETFs? I’ve also heard about Horizons HBAL as a tax-efficient fund. There are so many options out there, so frankly, I’m getting quite confused. I’m worried that when I start investing our extra funds in a non-registered account, it will be a disaster come tax time. Would welcome any insight you have on this! Great questions and thanks for being fans! HSX is a S&P 500 Index ETF. HBB is a Canadian Bond Index ETF. HCON is one of Horizon’s all-in-one funds; for more conservative investors looking for a total return approach. HBAL is another all-in-one fund; for a more balanced (70% equity/30% fixed income) total return approach. I don’t invest in any of these Horizon ETFs myself, I prefer to own Canadian dividend paying stocks inside my non-registered account and inside our Tax Free Savings Accounts (TFSAs) for passive income and growth – you can see some of those holdings here – but I know such funds are some great low-cost alternatives compared to many pricey mutual fund products I’ve eluded to above! The tax-efficiencies you refer to in some Horizon ETFs come from the use of swap-based agreements to deliver returns. What the heck does that mean? In a nutshell, the fund uses an agreement with another institution (National Bank I recall) to drive growth. This way, instead of being taxed on the distributions paid out by the Horizon’s ETF, as part of taxable account investing, those gains are harvested/compounded – so you only (in theory when your retirement income is lower) pay capital gains when you sell ETF units. This swapping of current ETF distributions for long-term capital gains can be very attractive since if folks have maxed out tax-sheltered TFSAs and RRSPs, and they have money to invest in a taxable account, the swap-based ETFs that defer these gains can be an efficient – capital gains are an efficient form of taxation – far more efficient than taxation from employment income, interest, other! The main drawback of this approach, from what I can see, is if you want money for retirement (versus relying on dividend or ETF distribution income) you’ll need to sell ETF units periodically (a cost) potentially at a time when you don’t want to (market lows?) AND pay any gains incurred come tax time (another cost). Be mindful that while capital gains are an efficient form of taxation as part of long-term investing, you’re still on the hook for taxation at some point. So, all this to say, there is no free lunch when it comes to taxation – but if your goal is to defer capital gains for an extended period of time these funds can be a great solution over far more expensive, and far less diversified solutions! 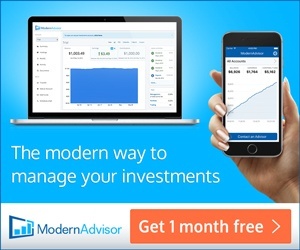 You can find other great, low-cost all-in-one ETFs to own here. Personally, I love the plain-vanilla ETFs with no frills, without the use of swap-based agreements but then again, I don’t invest in any ETFs outside my RRSP. Here is a full blog page of low-cost ETFs to build a great, tax-efficient portfolio with. I am a regular reader of your website and have a question. I am looking to create a dividend only portfolio that provides monthly income, highest return and lowest risk. Which dividend stocks or ETFs would you recommend? Boy, it would be nice to know the future, so I could tell you how to maximize income/return and minimize risk over time. My crystal ball is always very cloudy though! I like Canadian utility companies myself for income. The way I see it, everyone wants to heat or cool their homes in Canada – we all need energy and electricity. Based on that thesis I own many of the stocks in the iShares ETF XUT directly. I also believe a great way to Beat the Banks is to own Canadian bank stocks. I do (and most of us do via low-cost Canadian ETFs or pension funds anyhow). If you don’t want to worry about stock selection risk (i.e., what happens if one or two or few companies totally go under???) I would also consider some low-cost, income-oriented ETFs on these page here – offering some growth but also some income. With any ETF, including dividend ETFs, I certainly can’t guarantee the distributions from these funds will continue to go up (they could stay flat or they could fall), you should have assurance you will receive some income, diversification and some growth all working in your favour over a long investing period. You may also wish to Google some low-volatility ETFs, like the BMO ZLB fund. “Low-vol” funds fit into a category of “smart-beta” funds which is really a fancy term to suggest that you can get strong equity returns from proven factors designed into the fund. Examples: funds that re-balance to own inexpensive stocks (value), funds that hold stocks that are trending positively in price and earnings growth (momentum) or funds that hold stocks that exhibit greater price stability than the market as a whole (low volatility). If you want to read about smart-beta funds – check this out – the executive management team from First Asset Management was kind enough to talk to yours truly about these funds here (no affiliation – just good knowledge to share)! “Low-vol” funds tend to invest in less volatile or defensive stocks that may benefit from a smaller decline during market corrections, while still increasing in price during advancing markets. Thanks for your reader questions – I enjoy them and learn from them. Thanks to some disciplined investing, sticking to our plan and holding the stocks we do; reinvesting most dividends paid wherever possible, we’re on pace to earn $18,400 this calendar year in dividend income from our non-registered account and TFSAs. Onwards and upwards! Stay tuned for an update next month and a book giveaway about Your Ever Growing Income later this week! 39 Responses to "March 2019 Dividend Income Update"
I agree with Mark, that you should stick to dividend growth stocks in the non-registered, but I’d possibly suggest going with Low Yield, High Growth stocks. Ones with a long history of maintaining their dividend growth rate. Two to consider might be CNR & MRU. I’ve never done it but BRK.A would be another option as they don’;t pay a dividend but have a great growth record. Those are good stocks – I want to own more CNR myself!! If income is ones goal, than your investment choice is easy, stick with companies that have a history of sharing part of their earnings by way of dividends to shareholders. Avoid those that do not or ETFs which do not provide the income that quality individual stocks do. I have no reason to change my approach 🙂 Thanks for being a fan! Mark, IIRC I read recently the latest budget is closing that “loophole” with regards to the swaps on some Horizon ETFs. So far ZLB has been a real winner with much better sector balance than the TSX. Will it revert to the mean over the long term? Continued best wishes on the dividend income journey. I have nothing against the Horizon’s products, they definitely serve a great niche; the current rules allow such funds to operate and support a total-return approach like I wrote about but the government can always change it’s rules. This is potentially yet another reason to own simple products. $23k per year across all accounts is still pretty amazing given you have kids to worry about!! Well done Bob. Both you guys are doing great. Nice job so far. Looking at the graph it seems the *target* for 2019 was/is $19K. Was that an actual target or just a figure used to create an illustrative graph? If it was an actual target, is this “missing” of a target caused by something you’ve consciously done? Using funds for the new house? More growth targeted assets versus products with distributions? Having asked that, I note that there are likely more dividend increases yet to be declared as we are only into the fourth month of the year. Just a guess, a very loose estimate based on how much the portfolio could likely increase over time given we are re-investing dividends quite a bit. Is it accurate, no, not likely but a goal nonetheless. Gotcha. And if I recall you calculate your dividends at par so if you were to convert to $C you’d be a lot higher than indicated here. In any event, well done. Well, those monthly updates are non-reg. + TFSAs (x2) only. We have x2 RRSPs and that’s where my U.S. stocks and U.S. ETFs go – which are not part of these reports. The non-reg. + TFSAs are projected to earn about $18,400 per year, this year. The target is $19k (or more I hope?!). RRSPs churn out another $18k and increases every month as well but I don’t report that since I will draw down RRSPs starting within 10 years. My focus is on non-reg. + TFSAs because it’s tax efficient and tax-free money way to invest, so I/we can live off dividends for many years (the capital stays intact) and I’ve long since calculated earning $30k per year from these accounts will be “enough” to cover what we want. <$12k to go!!! There is no reason if things continue to grow, we won't reach this $30k goal by 2024 or 2025 and part-time work begins for sure. I think I've used 1.25-1.3 in my CDN to USD $$ exchange rate but I really don't nickel and dime that on my spreadsheets. I’m not sure why I assumed you’d have dividends paid in $US in your TFSA. Probably because I do (AQN, BIP.UN in the TFSA). I ought not project, sorry. My spreadsheet will automatically convert when I enter a change to the dollar. It can easily change the forward annual earnings by several hundreds of dollars. I can see why some don’t bother and just accept the new value when it comes in. All good Lloyd, you can put those stocks wherever you wish! You’re right about the change. Based on your comment, just for kicks, I increased the exchange from 1.25 to 1.3. That alone increased our dividend income by $700 per year. Good work as always, Mark. This year so far what I collected from different accounts covers 85% of what I have actually spent. Considering tax, I have more than 15% to go for the FI crossing point. But as I don’t mind to touch the capital, maybe I have less than 15% to go? Anyway, not ready to retire just yet. I guess I need to seriously investigate what to retire to already. I mean, what I will do in retirement. That’s equally important as how much to retire to I assume. I think if you’re going to touch the capital, you have FAR less to go. I’ve calculated that a $1 M portfolio will take 20-30 years to spend down, at about $50k-60k per year. That excludes my pension and CPP and OAS. My wife also has a pension and we’ll be spending that in another 5-10 years. I 110% agree that you need to figure out what to do in retirement which is MORE important than having enough money. Continuing to work is an easy answer. Stopping work and finding other things to do is a far more difficult decision. Just me! May, sounds like you are making fantastic progress. Your answer could be as easy as VPW. Having experienced retirement for nearly 5 years myself I would agree with you and Mark it’s smart to truly think about and plan what your (and spouses) typical retirement day/week/month etc will actually look like. Assuming the financial side is good, IMO knowing this will probably help with the decision when to go, what to do and help ensure a happier retirement. Mark, you’re also making fantastic progress and projections continue to be conservative! I think both “enough” money and figuring out what to do to make you happy could be equally important. Might be hard to do one without the other. Yes, continuing to work is an easy answer, but IMHO might not be the best one for some if they also consider age/time/health/goals etc. Fortunately I’ve been happy no matter where I’ve been in my life stage. Didn’t really have an exact “enough” or crossover number number per say. We went with a lot less than originally planned for a variety of reasons. Both of us just decided we could enjoy not working more, and felt flexible enough with lifestyle and safe enough with finances to do it. I eased in P/T for 2.5 years. So far that’s definitely been the right course for both of us. No regrets. May – did you see this article on VPW? @Mark & @RBull, actually both of us continue to work is quite challenging considering our jobs are demanding and consuming, the kids are demanding and consuming too. With our age/health, it will become more challenging as we are getting older every day. That’s actually the reason why I am actively planning for retirement. We cannot cut off the kids, so cutting off the jobs looks like the only choice. Most likely what we will do is one of us retires first and takes care of house work and kids, so the one still working will be less burdened. I think that might be the way we gradually ease off to retirement life. Ha, I agree, and he knows where I stand on that already! Makes sense on your plans. After you both retire and kids are older you’ll have even more free time. Sounds like a great game plan actually….re: one retires or works part-time first, helps out at home; the other can continue working or wind work down over a period of 1-3 years. Very smart to me. I see and hear of a number of folks that do that Jimmy – own CDN dividend paying stocks for the dividend tax credit – and/or they own stocks that pay little to no dividends and focus on a low-dividend but modest growth, since capital gains is an efficient form of taxation. We plan to do exact the same thing as you. Assuming withdraws $20K from RRSP, tax to pay is $1661. If adding $10K dividend, tax to pay decreased to $1187. As our RRSP size is quite decent, I think this will be a good strategy for us, at least in the early days when we draw down RRSP. May, is the reason this works due to one spouse still earning employment income, in order to generate the kind of range you’ve mentioned before. Using the 20K RRSP, 10K dividends numbers here works out to only $84 in tax. But it doesn’t work because we need more than that and also have a work pension to claim. I used this one to calculate tax in BC, so it’s a very simplified calculation. In BC, dividend under $10K has a negative tax rate. I think you are right, if you have high pension or withdraw a lot from RRSP then it will not work out. I think It works for people without pension and delay government benefits. Let’s say for one person, $30K from RRSP, tax $3667. Adding $10K dividend, tax $2778. If both do this, will have around $75K to spend, that will be enough for a couple without kids in retirement I assume? Assuming comfortable but not luxury lifestyle. Not luxury, no, but very nice all the same assuming no debt. I suspect my cohort (Gen X) would be thrilled to earn $75K per year in retirement. Heck, I know for a fact my wife and I can live off that and intend to. That’s insane. Are you saying in retirement you can withdraw $20K from an RRSP + have $10K in taxable dividend income and only pay $84 in taxes per year – assuming no other income?? Yes $84 on 20+10, if you have spouse with no income; using a quickie on taxtips. If you have a spouse who earns income they pay their appropriate tax and the tax on the 20K+10K also goes up to $2270. Must have to do with some kind of credits/deductions for low income household on the $84. So unfortunately its not of benefit to us. I think you know where we are. May, using the 30+10 = about $5300 here each. About double. Our actual numbers are way more than that. @RBull You have a very nice retirement life. We will need more than that when the kids are still in home. I don’t have a withdrawal strategy yet, just playing around. As I don’t mind touch the capital, I might sell some units in my taxable account to supply the income and only pay tax on the capital gain part. Tax optimization will require lots of work I guess. Thanks, we’re getting along fine. I think there will be 2 more very successful retirees joining the ranks in not too many years to come. Yes, the tax optimization and withdrawal stage can take some planning and tweaking. I’m working from RRSP withdrawals on mine (for living, topping TFSA and small unregistered contribution) plus dividends from unregistered. At some point unregistered will also be utilized, and finally tfsa. What a massive amount of dividends! Always exciting to see these updates. I agree with RBull, the days of fancy swap based ETFs as a way to avoid tax are numbered, it’s hard to go wrong with simple investments that are easy to understand. I only own physical ETFs, ETFs that actually hold the underlying investments, never was a fan of synthetic ETFs. There is always additional risk with a synthetic ETF, the regulatory risk they now face in the new budget is a good example. I really like the simple, easy to understand ETFs myself. There are enough headaches with investing without putting the use of swap-based agreements into the equation. Just me!